Proteases (EC 3.4), enzymes originally used to cleave the amide bonds of proteins by hydrolysis, have been utilized for the enzymatic synthesis of peptide compounds. This enzymatic synthesis of polypeptides is a biomass-based, environmentally benign, atom-economical, and stereo-/regioselective method that can replace petroleum-derived chemical polypeptide syntheses. Enzymatic polymerization of amino acid derivatives using proteases proceeds via the reverse reaction of hydrolysis, which is aminolysis, in an equilibrium. 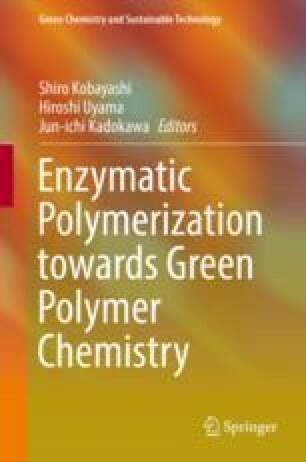 Thermodynamic and kinetic controls in the aminolysis reaction rationally optimize enzymatic polymerization efficiency. Polymerization is regulated by the substrate specificity of proteases, namely, a combination of amino acid monomers and proteases. A great number of polypeptides, including homopolymers, random/block copolymers, and specific polymer architectures, such as star-shaped polymers, are synthesized by a protease-catalyzed polymerization technique. In this chapter, versatile designs and syntheses of polypeptide materials using various types of proteases are entirely reviewed in detail.